Get Ready to Make a Bloomin’ Onion! Backyard BBQ’s are in full swing and what could be better to start the party than a Bloomin’ Onion! 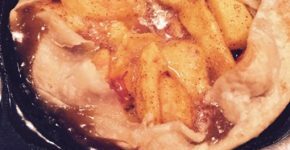 I’ve made this recipe several times and it gets rave reviews every time! Make a Bloomin’ Onion for Your Next Backyard BBQ! 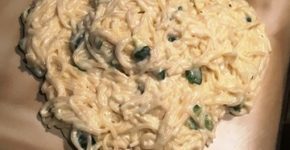 This is easy to make and is like the Bloomin’ Onion at Outback Steakhouse. You don’t need any special tools to cut the onion – just a sharp paring knife will work. Here is a great tutorial: How to Slice a Bloomin’ Onion. Now…here is the recipe. Don’t be intimidated by the number of ingredients because most of the ingredients are seasonings. 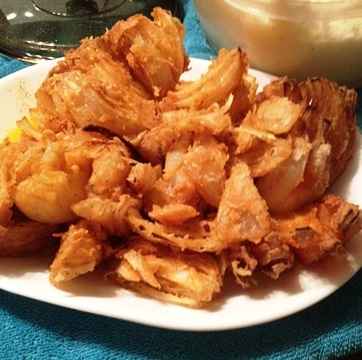 Here is the easy recipe for a Bloomin' Onion. This is a great recipe for your next Backyard BBQ! To slice the onion, cut off ½ inch from the pointy stem end of the onion (the top) and peel. Place the onion cut side down. Starting ½ inch from the root end, make a downward cut all the way through to the board. Repeat to make four evenly spaced cuts around the onion. Whisk the flour, cayenne pepper, paprika, thyme, oregano, cumin and ½ tsp. black pepper in a bowl. In a separate bowl, whisk the eggs, milk and 1 cup water. Place the onion in a separate bowl and pour all of the flour mixture on top. Cover the bowl with a plate, then shake back and forth to distribute the flour. Lift the onion by the core and pat off the excess flour. Using a slotted spoon, fully submerge the onion in the egg mixture (spoon on top if necessary). Remove and let the excess egg drip off, then repeat the flouring process. Refrigerate the onion while you heat the oil. Heat the oil to 400 degrees. Using a wire skimmer, carefully lower the onion into the oil, cut side down. Adjust the heat so the oil temperature stays close to 350 degrees. Fry about 3 minutes, then turn the onion over and fry until golden, about 3 more minutes. Season with salt and pepper and serve with the dip. This dip can be made the day before your BBQ and it will keep for several days in the fridge. You can make this a day or two before your BBQ.